You&apos;ve seen the image in galleries and in fancy maritime calendars. It&apos;s an idyllic photo or painting depicting a dinghy dock somewhere in New England boasting so many pretty, sharp-prowed little boats that you can&apos;t see the water on which they&apos;re floating. These classic wood skiffs and their fiberglass descendants are still with us, particularly in northeastern waters. But, despite their durability and nostalgic appeal, they are the least perfect of tenders available for cruisers today. Hard dinghies, as they are now called, continue to serve boaters in areas where big boats lie on moorings and their masters row out from shore, leaving the 10-footer attached to the mooring while the big boat is out tooling around. When it&apos;s time for a fair-weather Downeast cruise, the dinghy gets towed behind. And that&apos;s fine, because it&apos;s only on temporary duty as a tender. It&apos;s a perfect little skiff for rowing with perhaps a single passenger on the aft bench, but multiple trips are required to transport two couples or mom and the kids. Boats with pointed bows show their instability when anyone tries to board forward of the beam, and it is always challenging for one person to operate an outboard without a second body acting as a counterbalance to keep from swamping. The pram design, with transoms at both ends, offers better stability but, of course, does not row as well. Some modern versions of the pram in fiberglass and molded plastic have a W-shaped cross section that further enhances stability by distributing volume outboard and makes for better tracking when towing at speed. The plastic variety has the added benefit of being very lightweight. None of these refinements, however, outweigh the pram&apos;s disadvantages in serving as a tender to a normal cruising complement of two to four people. Americans, blame yourselves. Government statistics show that the average man weighs 25 lb. more than he did in 1960, and the average woman 24 lb. more. The added buoyancy needed to carry our heftier bodies means we need bigger hard dinghies than in the past. Many cruising boats just don&apos;t have the deck space to hold a hard dinghy that&apos;s large enough to do the job. The ideal cruising tender is tough, stable, and portable; has the capacity to carry everyone on board; and goes fast enough. In the category of toughness, the hard dinghies win, and that&apos;s why there will always be some lean and mean cruisers who continue to keep them in service and even row them. For the most part, however, the best tenders are inflatables, a military innovation spawned during World War II. Their flotation chambers are encapsulated by rugged, modern materials such as Hypalon or PVC, but no one would claim these are puncture-proof against a coral outcropping or a rusty hunk of rebar on a Third World wharf, and they are often derided by their owners as "deflatables." Their inherent vulnerability aside, inflatables are prized by cruisers for their other attributes: stability, load capacity, portability, and speed. Anyone who&apos;s been to George Town or other Bahamas destinations has seen cruising couples moving about the harbor standing upright in their inflatables, bouncing along at speed. One has the outboard tiller in hand; the other stands in front with the painter taut, leaning back just a little. Many cruisers like this pose because in choppy water, inflatables tend to ship more spray than a hard boat, and they&apos;d rather get their bare knees wet than their clothed parts. The inherent stability of a blowup boat means that it takes a big breaking wave or willful effort by the crew to overturn one. Boarding and loading are easier, and the rubberized, inflated tubes are easy on the mothership&apos;s gelcoat and silent against the hull. Even a 10-foot inflatable can carry four adults-yes, even today&apos;s supersized models. Ten- to 12-foot inflatables are the coin of the cruising realm because they are wonderfully portable. Deflated, folded, and bagged with all gear inside, a 10-footer can be stowed in a space barely 3-1/2 by 3-1/2 by 1 foot in size. Inflated, they suspend easily from stern davits or can be hauled onto a foredeck. One of the simplest ways to haul an inflatable is to hoist it aboard the swim platform and lash it against the transom. If rowing is important, choose your inflatable carefully. Most include oars that are too short and have flimsy plastic oarlocks. Better boats feature beefy rubber oarlocks, which you can use with conventional oars of your choice. Most bigger inflatables abandon the notion of rowing entirely and include a couple of emergency paddles that strap to the inside of the tubes. Early inflatables tended to buckle in a chop, but manufacturers developed a variety of solid floor inserts that stiffen the boats and mitigate this tendency. Some include an inflatable keel section that gives the bow an "M" shape for better tracking under tow. Other innovations, such as solid transom mounts for the outboard and tubes that extend well aft of the transom, have resulted in boats suited for outboard horsepower that&apos;s enormous relative to their size. Which brings us to speed. Again, the ideal tender is one that goes fast enough. Obviously, this is a relative term. Some folks are happy with an economical putt-putt for their twice-daily run to the beach with the family dog; others need to zip around the harbor like Mad Max. 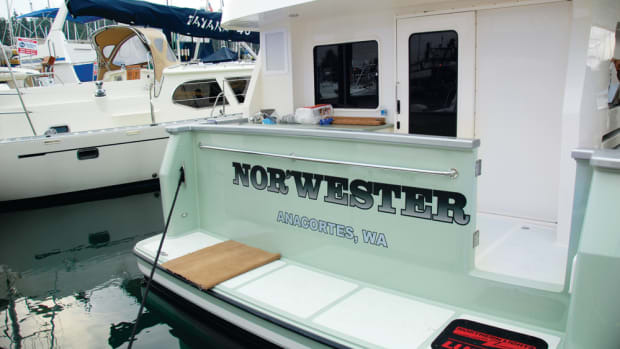 In general, however, the slower the mother vessel, the better it is to have a fast tender; this specifically applies to sailboats and trawlers. 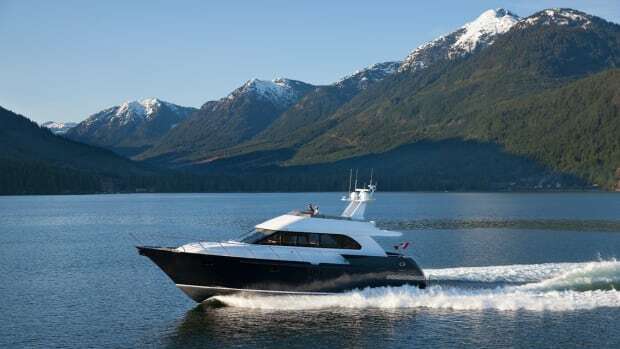 A fast tender allows the boater to choose his or her anchorage based not on proximity to the marina or shoreside amenities, but on its aesthetic merits, privacy, best holding ground, and such while maintaining quick access to land. The greatest inflatable innovation regarding speed, of course, is the rigid bottom. By attaching a V-shaped fiberglass bottom to the inflatable tubes, manufacturers eliminated entirely any tendency to buckle. The sharp "V" forward, moderating as it sweeps aft, makes it a joy to tow. Combine that shape with a small center console and 25 or more horses, and the result is huge performance in a boat as small as 12 feet. Rigid inflatable boats, or RIBs, as they are called, sacrifice portability, although smaller models still pack up into something shaped like a fat surfboard. Despite their towing design, RIBs are more likely to be found suspended from stern davits or chocked on the foredeck or atop the house, where they&apos;re deployed via an electric davit and winch. These arrangements may have a psychological effect. 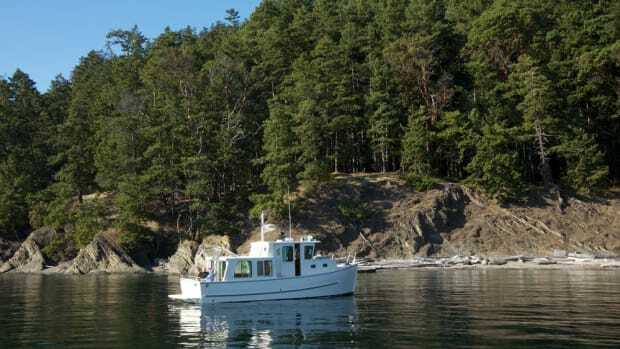 Because of the added procedure in launching the tender, some folks might tend to use the little boat less often than they would otherwise, thus squandering the spontaneous opportunities that abound in cruising, such as exploring some primordial creek or driftwood beach. There may be another psychological effect as well: a RIB represents real money spent, and worry about damage or theft might take some of the fun out of exploring. Still, a big RIB is the tender of choice among owners of boats from trawlers to megayachts, with the RIBs on the latter looking like something from a Navy SEAL wish list. Megayachts often stow their tenders inside, hauled in through openings in the stern and sealed away until needed-a process that sometimes invites a host of crass dockside commentary. Meanwhile, the sportfish crowd has its own way of thinking, and it&apos;s retro thinking at that. These guys never forgot the art of towing, and they&apos;re not afraid to do it. It&apos;s not unusual to see a 60-footer trailing a hard-bottom center console of 18 or 20 feet on a bridle and long tow. This arrangement gives them terrific flexibility to fish and move about the islands in general. You get the picture: Your choice of tender involves multiple compromises. No tender is perfect. Evaluate your cruising style, and anticipate how you will really be using your ship&apos;s little boat, how you will stow or carry it, how you&apos;ll get aboard it, and how fast or far it will need to go. Weigh the compromises carefully, and then go weigh yourself. Ultimately, selecting a dinghy may be the most important equipment decision you&apos;ll ever make. If you&apos;re like most cruisers, your choice will likely come with a patch kit-and you&apos;ll probably need it.